Since tapping a couple of sugar maples last week, the weather has been mostly below freezing, so until today there have just been a few hours of collecting the sap. 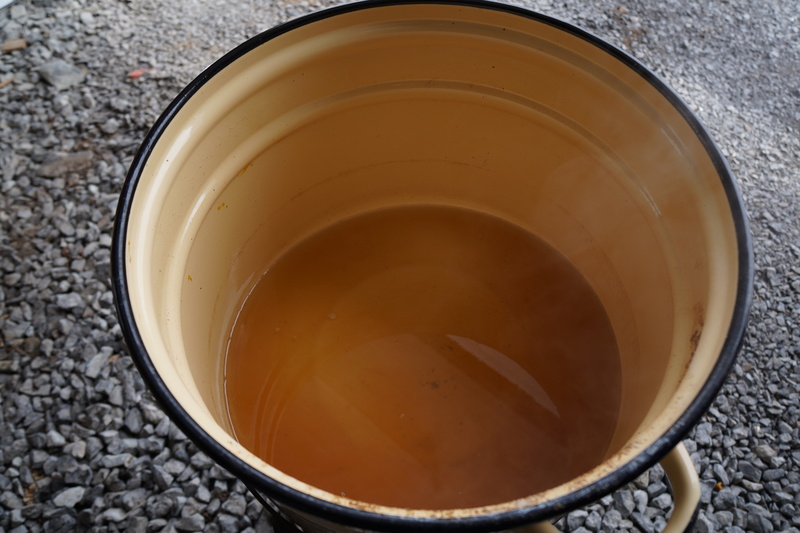 Today, with relatively seasonal temperatures, we were able to collect two large pots worth (5 gallons each) of sap and have a go at boiling it down to make syrup. The result is 1 1/4 litre from the first pot, and about 3/4 litre from the second. The second is thicker and came dangerously close to crystalizing. If you are thinking of tapping your own trees, this site has good pictures and instructions on how to do it. As for the cooking down, we strained the sap through a clean, wet tea towel. For fuel we used up left over propane gas, hooked it up to the base of our turkey frier, and boiled it gently for about an hour. 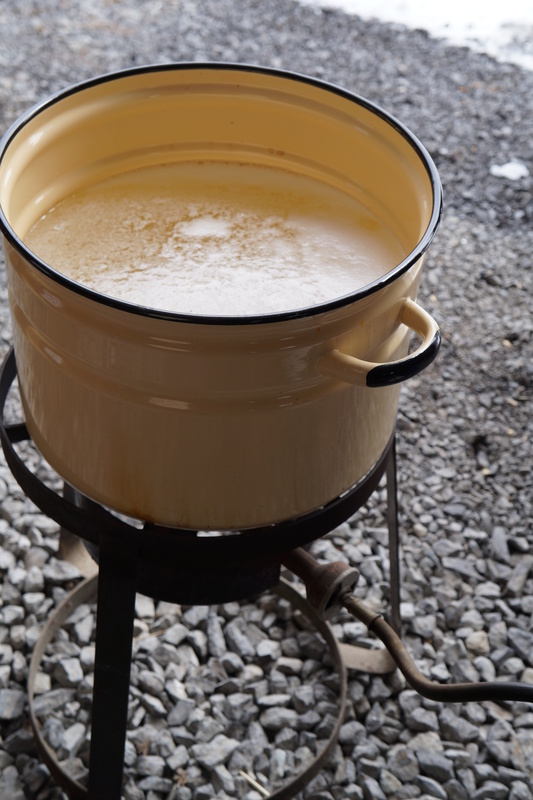 You can also do it over any open charcoal or wood fire. It needs to be done outside, as there is a lot of steam, sticky steam, released. Once it was boiled down considerably, to about 2 litres, we brought it inside, strained it again and cooked it even more gently on the stove top for another half hour. I then strained it again through a coffee filter into sterilized jars. It was a much faster and easier process than I had thought, although it has to be watched constantly as it can boil very hot and spill over if you are not careful. After all the time spent outdoors, I was not up for baking, but was up for a cocktail to celebrate our success at mastering this art. This recipe is from Serious Eats where you will find a number, 12 to be exact, of cocktails using maple syrup. I chose the one for which I had all the ingredients for today – and it turned out beautifully. Simply measure 1/2 oz syrup, 1 1/2 oz rye, 3/4 oz lemon juice and 1 fresh egg white into a shaker and shake for about 20 seconds. Add 1 ice cube and shake another 10 seconds. Strain into a glass and add a few drops of angostura bitters on top. I am using the leftover egg yolk to make pancake batter for tomorrow morning which will be served with our own home-made maple syrup. Hope to try some of the others soon, and maybe even add a few of my own. Categories: alcoholic beverage, sweets | Tags: cocktail, foraging, maple sap, recipe, syrup | Permalink. 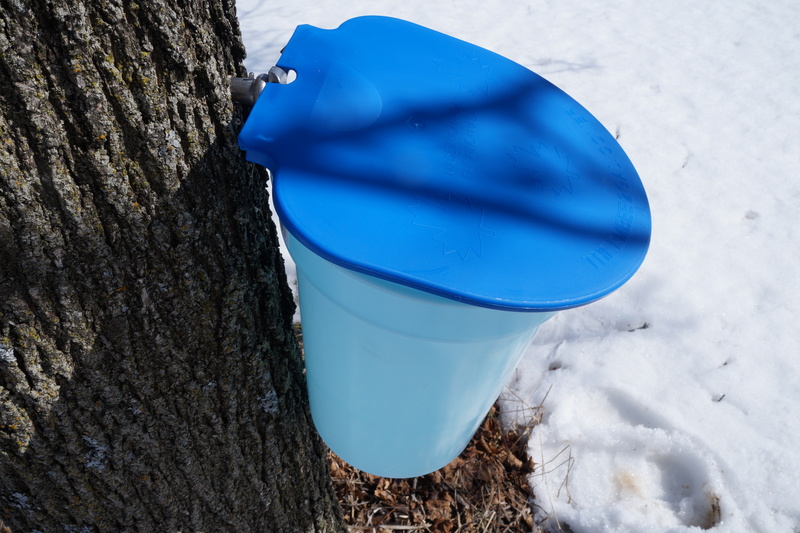 We have started to collect sap from our two sugar maples. This won’t give us a lot of syrup once we process it, but at least we will have the satisfaction of home-grown maple syrup – the quintessential wild food in this area. I will post more on this once we have collected enough. The varying temperatures are slowing things down considerably, but I am in no hurry. Meanwhile I have been contemplating what else I can do with all this sap. For example, I have often wondered why we don’t save some sap for just drinking as is, as they do in Russia and neighbouring countries with birch sap. Now I find that here in Canada, B.C. and Quebec have started a maple water industry which is being touted as a health drink, and is sold in stores right next to the coconut water. I hope this trend catches on throughout the country. If you want to read more about this, check here. 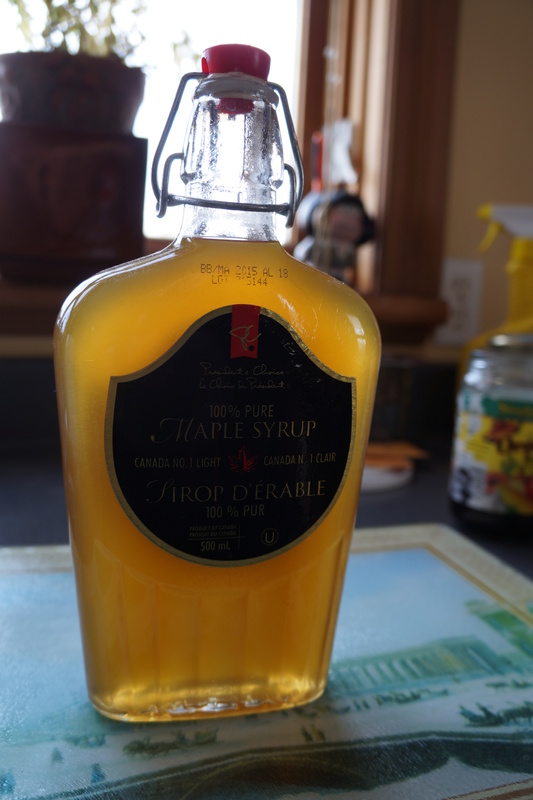 For those of you who do not have either sugar maples or a place where you can boil down the many litres of sap to make syrup, you can still take advantage of the season and put your sap to good use. Besides the two sugar maples, we tapped one Norway maple, which I always considered a bit of weed in the tree world. Apparently the sap from this tree is not as sweet, but tasting it on its own, it is very much like the sap from the sugar maples. Unfortunately, we lost our birches last year, but if anyone has experience with birch sap, I would love to hear about it. There are lots of uses for this ‘health drink’, such as making tea, porridge, and even beer. 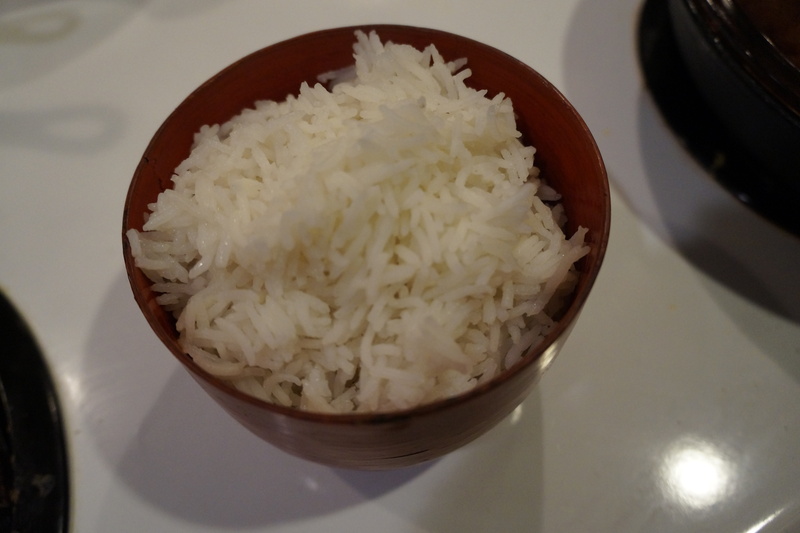 My first experiment with it was to make white rice. Simply substitute the sap for water. It gives the rice a slightly sweet flavour, and is really delicious – even on its own. I served it with fish in a spicy curry, and the sweetness was a perfect complement to the heat of the sauce. So if you have an undistinguished maple, all you need is a clean, food-safe bucket with a lid, a spile (you can get these at most hardware stores in Canada) and a drill, or at least someone with a drill. Just be sure to keep the sap colder than 40 degrees F to prevent bacteria from growing. Then you can make your own maple sap rice, or whatever else you fancy. Categories: recipes | Tags: Canada, foraging, locavore, maple sap, rice with sap, spring | Permalink. 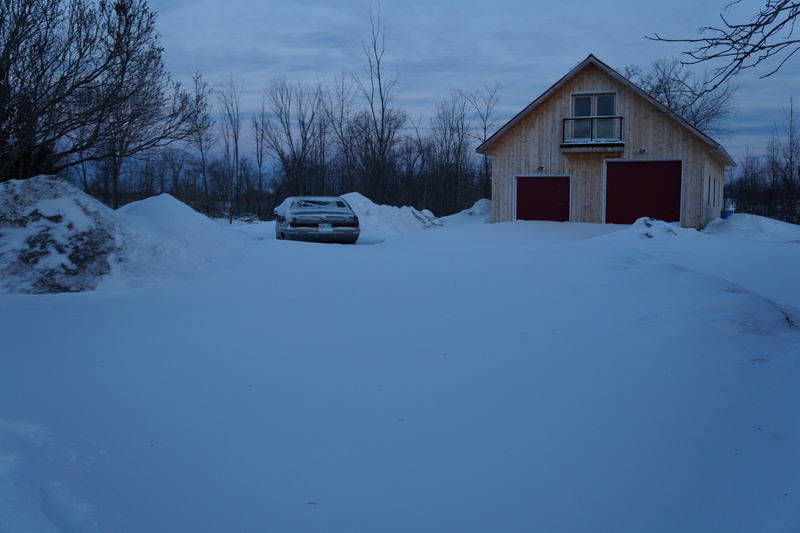 It is still winter here in SE Ontario, not much happening on the foraging front – the landscape looks like a white desert – except for the odd oasis of red staghorn sumac. I can’t imagine either the winter or the sumac will be around much longer, but with nothing else around I ventured across snow dunes in search of food. The berries aren’t quite as red as they were in the summer, but they are still tasty and easy to harvest. Once the rain starts, they will lose much of their flavour, and I expect finally disappear to make room for new growth. At least, I hope so. I made another batch of dried sumac and a few cups of sumac juice – which incidentally makes a lovely hot tea on these cold afternoons, and now that I think of them as a desert fruit, the tea tastes very much like red date tea. But as a recipe for Angie’s Fiesta Friday, I wanted to turn it into a festive drink – and I had to make it hot to counter the bitter cold we are still experiencing. The recipe is very simple, but as tasty as any whisky cocktail I have had in a bar – just a lot less expensive. I used Canadian rye, but whatever you use, I would not mix a complex and highly flavoured whiskey. I decided on this recipe because, not only is it cold, but many people are fighting off flus and colds, and what better remedy than a hot toddy with honey and ginger! Mash the ginger with a pestle in the pot. Add the sumac juice and heat. Add the honey and simmer for about five minutes. If you like it sweeter, add more honey. Pour the whisky into a glass or mug. Strain the hot sumac syrup into it and add the angostura bitters. Stir and serve. 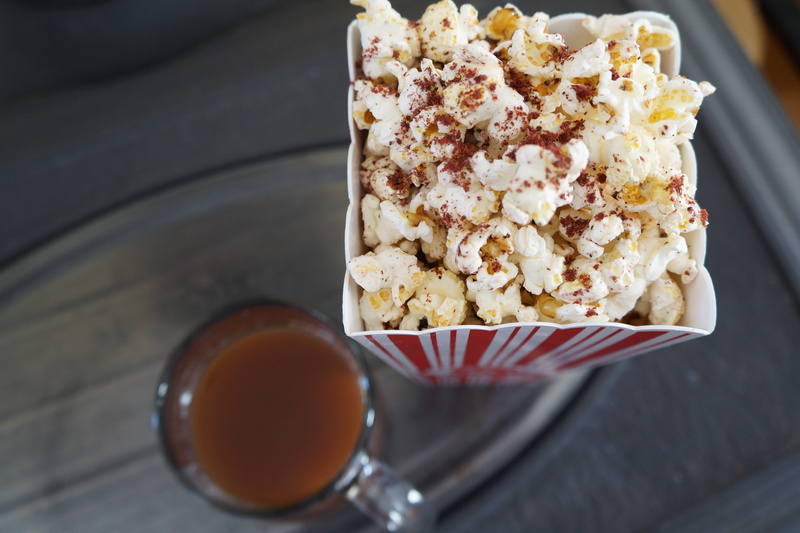 I served this with freshly popped popcorn, flavoured with oil, salt and sumac powder. The syrup is also very good on its own if you are not up for the whisky hot toddy. Categories: alcoholic beverage, drinks, recipes, wild fruit | Tags: Festive Friday, foraging in the snow, ginger, hot toddy, popcorn, red date tea, sumac, whisky | Permalink. Pickerel, or walleye as it is often called here, is a fresh water fish common in North American lakes. It is the fish I might have caught had it been warm enough to go ice fishing, but given the small number of fishing huts in the area, I am not the only timid one. I did manage to find a good source of fresh, local fish which I’m sure is as good as any I would have caught. Besides, it came all cleaned and filleted. 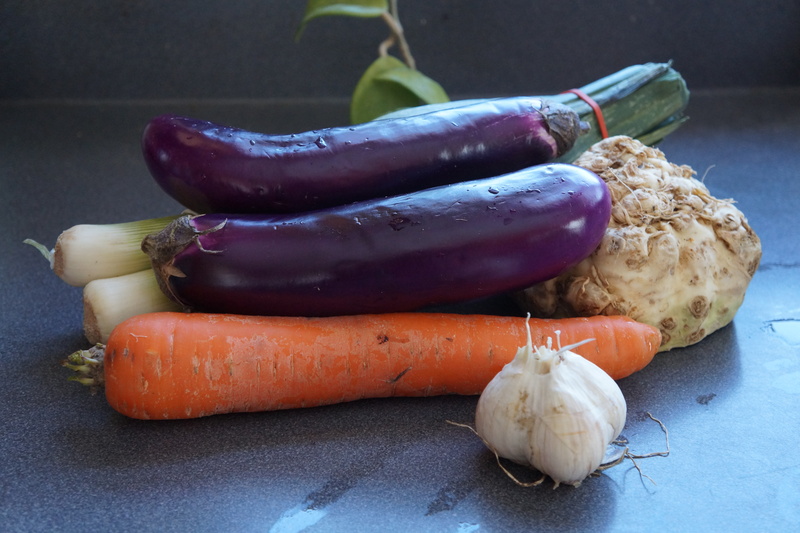 So this is my contribution to The Novice Gardener’s Fiesta Friday – seasonal, easy and wild. This fish is a close relative of the pikeperch, so that could be substituted in this recipe, as well as any white freshwater fish. 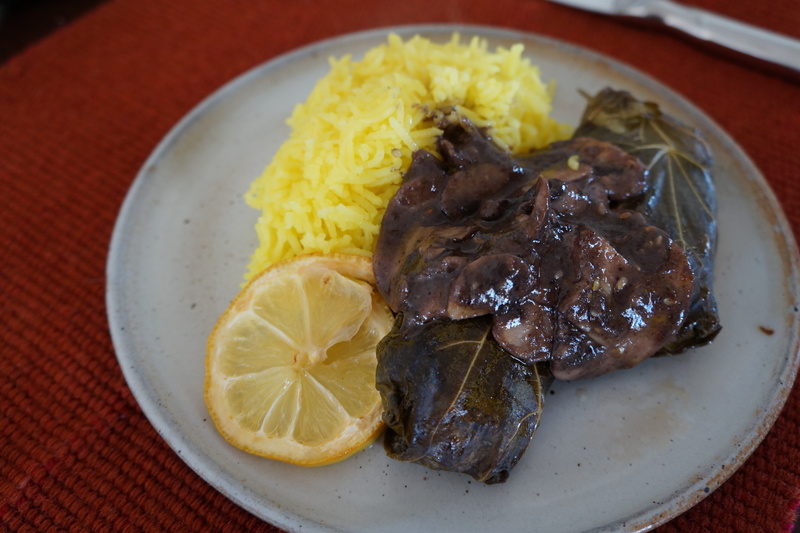 The other main ingredients are grape leaves and za’atar, and those are available in most areas. If you don’t have a stock of wild grape leaves in your freezer from last year, regular leaves are sold in jars in some supermarkets. Just be sure to rinse the brine off before using. If you don’t have za’atar, or the ingredients to make it, use any recipe for za’atar and replace the sumac with grated lemon zest. Remove the skin from the fillets if there is any. I used the skin to make stock which I used later in the sauce. Just cover with some water and allow to simmer until you are ready for it. Cut the fillets into pieces – some will already be small from the skinning process, but others can be about 2 inches long. Place them in a bowl and mix in the remaining ingredients, except for the leaves. Lay two or three leaves on a flat service overlapping slightly. If the leaves are very small, you might need four – two if they are very large. Place a large spoonful (1/4 cup) of the fish mixture at the base of your leaf arrangement. Fold upwards once, tuck in the sides and continue to roll up. If grilling, it might be wise to secure them with toothpicks which have been soaked in water. If using an oven, place them in a casserole dish, brush with a little olive oil and garnish with lemon slices. Bake in a 425 degree F oven for about 1/2 hour. These can be eaten hot or cold. I’m thinking of making some next time I pack a picnic. Meanwhile, I served these warm with saffron rice and a mushroom sauce. No need for a sauce really, or you can make whatever kind you like. This is how the sauce was made. Fry about a cup of sliced mushrooms in butter until lightly brown. Make a roux with 1 Tbsp butter, 1 Tbsp flour (I used chestnut flour to make it gluten-free), and 1/2 cup of fish stock. When the sauce has thickened, add the cooked mushrooms, 1 tsp of za’atar and salt and pepper to taste. Heat through and it is ready. This is a small quantity for two people, so just multiply it to get the amount you need. 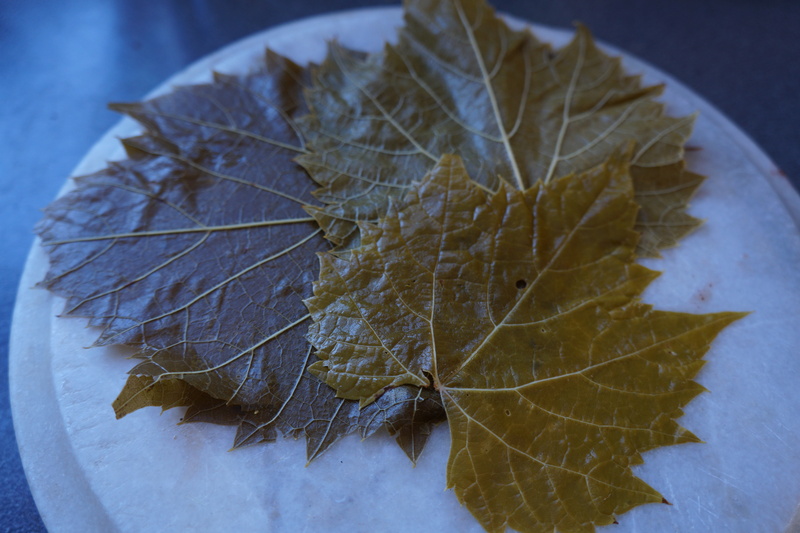 The grape leaves keep the fish from drying out or getting scorched if being grilled. They also add flavour to the delicate fish, and provide good packaging for any leftovers to be eaten cold the next day. 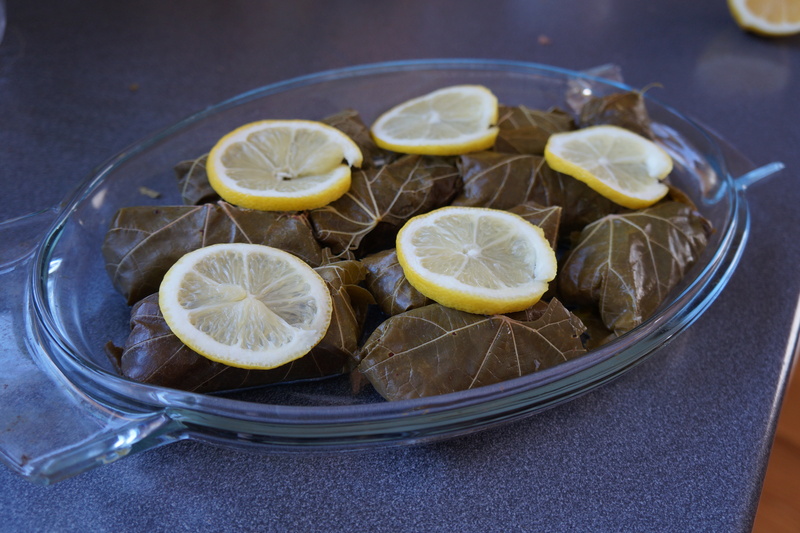 There doesn’t seem to be any difference in flavour that I can detect between wild and other grape leaves, so just use whichever is convenient. Categories: fish, main dish, recipes, wild fruit | Tags: Fiesta Friday, fish in grape leaves, foraging, fresh water fish, gluten free, locavore, mushroom sauce, pickerel, walleye, za'atar | Permalink.